The primary aim of this seminar is to provide an outline in the use of the SQL SELECT query design tools of the Administrator/Advanced User licences. Basic users can manipulate the Activities and Views provided, changing the SELECTed field list, WHERE, ORDER BY and GROUP BY (aggregate) clauses. The Advanced User can manipulate the FROM clause thus allowing them to create their own Views and Activities from any data in the database. 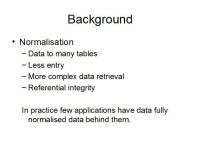 These are at the heart of database applications. They are what drive Management/Business Information systems (Dashboards rely on them); they provide the tactical information to make decisions for basic users and the summary information needed by customers and suppliers in the form of Key Performance Indicators. 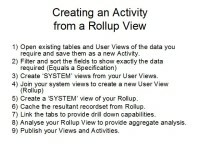 Getting Rollups right means accurate information quickly, that it is what this seminar is about. Getting a workable specification dramatically reduces the time and cost of new development, that is what this seminar is about. All notes are available from the f4b help system.